Tribune editorial: Why does Utah gamble on immunizations? 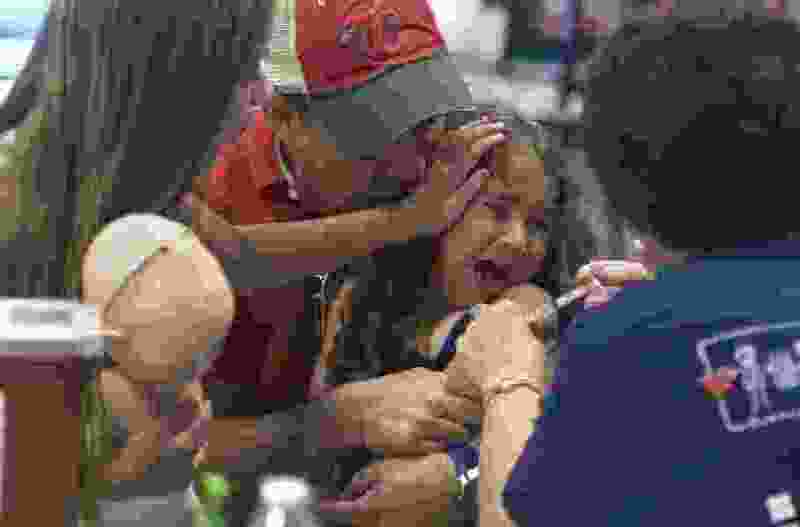 (Leah Hogsten | The Salt Lake Tribune) Samantha Lopez, 4, is comforted by her sister Genesis, 9, and her father Bernardo Lopez as she receives a total of three vaccine shots. The Community Assistance and Resource Event (CARE) Fair offers free physical exams, dental cleanings, child and adult immunizations, disease screenings and mental health assessments to patients of all ages on first-come, first-served basis. What started 25 years ago as free immunizations for about 300 children has transformed into a community resource that has served nearly 70,000 people. Most parents in Utah and elsewhere dutifully keep their children’s immunizations current, and as a result many serious illnesses are no longer widespread. Because they are no longer widespread, it has given rise to a minority who for whatever reason don’t vaccinate their kids and generally don’t see them get pertussis, diphtheria or other once-common illnesses. Utah is one of 18 states where parents can legally opt out of immunizations and still send their kids to school. Not surprisingly, those states hold the 15 cities where more than 400 kindergartners were not immunized. Both Salt Lake City and Provo are on the list. Who doesn’t immunize? It crosses the spectrum. Joining Salt Lake City and Provo on that list are Kansas City, Detroit, Pittsburgh, Portland and Houston. Meanwhile, isolated rural counties tend to have the highest opt-out rates. Idaho is home to eight of the top 10 counties in the nation for kindergartners not immunized. In Camas County, Idaho, more than a quarter of kindergartners weren’t immunized. In our otherwise healthy population, this is a blind spot. It’s all well and good when declining to vaccinate your children is just a lesson in libertarianism. But what happens when someone actually gets whooping cough? Three years ago The Tribune gathered immunization data for Utah schools, and we found 28 schools where the immunization rate was under 70 percent. They included rural and urban schools. The Centers for Disease Control establishes a “herd immunity rate” for communicable diseases that is considered a benchmark for safety. For measles, more than 90 percent of a school population must be immunized for the school to be considered safe for that small percentage of children for whom a vaccine is ineffective. In 2015, nearly a quarter of Utah schools didn’t reach that mark, including 14 percent in Salt Lake County. Utah needs to take a harder look at its exemption law. We cannot ignore sound science by claiming it’s government interference. Parents put more than their own children at risk. We don’t let children come to school with guns. Why do we let them come with deadly bacteria?